Ok... So I've been a bit preoccupied eh. Here we are folks. They say a picture is worth a thousand words but this one... This one really only sends one message. Just how deep Schotie's degree of obsessive compulsive nature runs. Welcome to the SacredWiki Sacred 2 Map of Ancaria at last! This is more or less a starter map which I've been working on for about a month now that I'd like to make available to you guys for inspection and experimentation. The map has been uploaded to my Maplib account which provides Google Maps API interaction. There are some touch-ups I will be making yet and would also like you guys to have a look over it and let me know what mistakes you might find. (Be gentle! ). If you think of any additions you would like to see on the map feel free to add them as markers. Toy around with this one all you like! I'll be adding a new one soon. There are a bunch of things I wanted to focus on with this map which mostly comprised of some basics. Place names were the first thing on my list mostly because I find it is the hardest to do when creating a map of this size. Majority of place names are in the map and even some extra named things which I thought might be useful in the future. Ok ok, the truth is I just couldn't stop, hehe. Let that be a warning to you all. If ever you see me with a label maker in hand, run for your lives, lol. After the names I added the various merchant icons. I had taken a particular interest in the various statues throughout Ancaria and so added those next. Deity statues which reduce the regen on your Deity spell and Hero statues which give you an experience bonus are on the map as well. Though not all of them I'm sure. Ugh! In addition to God statues, the Temples are marked as well of which each Temple hosts all 6 Deity statues. Portals next! All portals as of this date, and that I know of, have been added to the map as well as Monoliths. Man those were hard to do! Ships came on next and thankfully they were pretty easy and gave me a bit of a break. A short one at that... I think I'm starting to ramble so I'll get right to it. Here's a list of marker types you'll find on the map. I plan to add much more. Someone stop me please! Something that I think might be fun is the ability to add markers to the map. I've opened up this map for marking by anyone and more maps are certainly planned! This will be a great way to keep the map up to date and uuuh, reduce the workload for me, lol. You can go to the Sacred 2 Map of Ancaria page to add your own marker. You can also draw out a path or highlight a specific area using the tools you'll find on that page using the below tool icons. This tool allows you to left click drag the map. This tool is the default tool when viewing the map. This tool allows you to add a marker to the map. This tool allows you to draw a point to point line path. This tool allows you to draw a shape in order to highlight an area. This tool turns marker visibility on and off. Don't worry if you make a mistake on this map. It's only a draft so to speak and a new one is very soon on the way. Most of the focus will be to add markers to the map where needed. Great thing about markers? Well if someone happens to be looking for that elusive mini boss Thranak we could just provide them a link like so; Thranak Boss enemy. Pretty cool huh! This sort of function will be available to anyone. To do this you would go to the map page and to the right you'll see a list of markers. Each marker has a link symbol to the right of it. Clicking that link will open a new page of the map taking you to a zoomed in view of the markers location on the map. You could then copy the url address of that page and post it as a link to help others find what they're looking for. I've added a bunch of markers which anyone can choose from when creating a new marker. The markers I've added will be available to choose after you've clicked on a location to mark using the Marker Tool. Ok so for now I think I've said all I can say. *hears community sigh in relief* But I will be back with more of my ramblings. Have fun with it gang! I'm wondering if it would be possible to link to specific map squares, so you could post such a link when discussing that area. As with the first Sacred map you did using API, this one's details are just through the roof. Dragons, bosses, the new mini-bosses, AND quest paths. lol, anyone using this map is going to be pretty expert. I like what Trust has to say about maybe making one version of this map have a grid. It would allow peeps to refer back to it and we would all know where on Ancaria a specific game element was. Particularly useful in a gaming world this large. Take a break friend, you've earned it. ...woooow, im speechless, great job Schot! this means we will see you around more on the servers? You... Absolutely... Have... No life lol omgawd how many hours/days/weeks of work is in this thing!? Thanks a lot! This map is awesome! It's too big, I can only fit 2/3rds of it on my screen at once! Great job, now I know why you haven't been around much. Hope your idea of having others help works well. Thanx gang! It's been a loooong time coming. Omg... The next time Ascaron makes a change to the map I think I will probably cry, lol. Noticed the hard to get boss pathways eh, hehe. The worst was the drgaon in the swamps. I was going nuts trying to get up there. After that experience I vowed that no player will have to go through that much wall hugging. So yes, absolutely we can link to anywhere in any zoom on the map simply by dragging the map and zooming to where we want and then copying the Url Reference. Cool huh! Ok one last thought to add which just occured to me. Following the logic of the above what we could do here at darkmatters is create a topic which would list out by links to the map all of the place names of the map and anything else important. With this list we would have an index of location links which we could refer to and use in posts talking about certain areas of the world. Good idea? Bad? Ah gogo. I have to thank you for pressuring me about the bosses. Truth be told I wasn't even thinking of bosses when I started the map and yah kept hounding me about it. So thanx for that! Oh and yes a break. You mean like... Stop:) I don't understand. Yes! Finally! Haha. I have been putting off my purchase of the game so that I could complete the map but now that the hard part is done I'll be seeing you guys very soon. Yes... Yes, it's true. Hundreds Timo. Hundreds and hundreds. About a month or two in total and with absolutely every possible minute devoted to it. Basically all my gaming time went to the map. Ah the quest master himself. We'll be having a separate map devoted to quests very soon. lol Oh gosh. What was I thinking?! Thanx again for the kind words! Hey, that is pretty darned good! Called for some Final Fantasy Fanfare! 'Could you guys check out this T-Energy pool? It seems to have rather good monster drops, at least when I was last visiting it. I somewhat attributed to my "high" mf of about 17% at the time. " Amazing...I didn't know we could do that till you just worked it into your post! You, more than Schot, with this little demonstration have completely hooked me now. The ability to instantly access the wiki map this way and bring it into posts is unbelievably useful. Love that track and game Cygnus. Perfect victory music, lol. Thank you for the warning and constant tutelage Thek. I'll keep it to a minimum until I can create a MarkerManager. That Wowmap is an excellent resource. I plan to study hard. Thanx for the kind words all. Back to work I go! They just stickied your map on the German Sacred Forum. Wow! It isn't even stickied on the sacred international forum, lol. Cool! Is there a way I can download just the map? I wanted to put on my machine and then map out all the special NPC's for the Ascaron easter egg quest. I'd rather not try on map you have now as I don't want to clutter it and/or possibly mess it up. As yet I haven't supplied a download map because eeeeeh, it has some mistakes. For example I kind of put the Wastelands in the wrong spot, lol. I know I know. How the heck does one misplace an entire continent. I have corrected much of the htings I wanted to which means it will be downloadable soon! But if you'd still like create an Epic Office Quest map I can send you something for that. 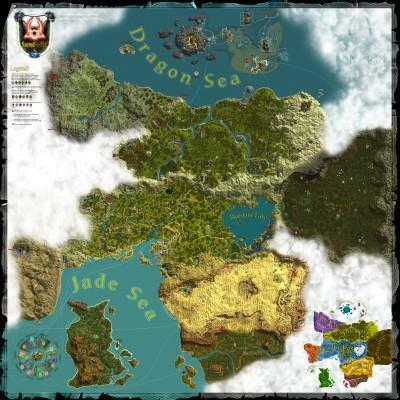 New map is availale... For Download! Little Christmas present to you all. Merry Christmas gang! Are the maps working? They show up blank for some reason.